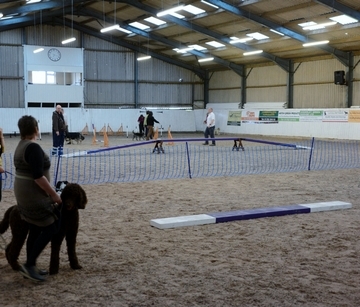 Churnet Valley Dog Training agility for fun classes at Lodge Farm Equestrian Centre, off Mill Lane, Wetley rocks, ST9 OBN, Staffordshire. New courses start on Monday the 25th of February. 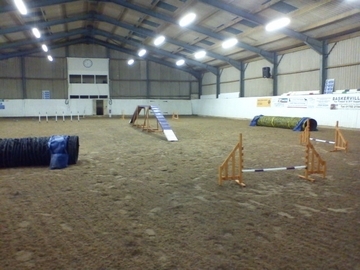 Agility course's run for 6 weeks. 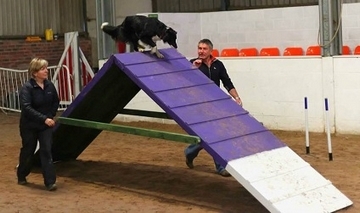 Dog Agility classes for fun are for the pet dog owner to enjoy this popular sport for fun not competition. If you want something extra to do with your dog but are not competitive then this class with be the class for you. Attention is paid to safety and you will be taught each piece of equipment separately before starting to sequence them together. Don't worry if you cannot run about, I design the sequences and courses so you learn how to send your dog on and turn him or her so handler's don't need to run about too much. There is no pressure to do anything you can run the whole course are just part of it if you like. Everyone is very friendly and the weekly agility class is a great social event too. We have the odd fun night where you can win a rosette for a clear round, or the best dog walk, long jump etc. Everyone gets a rosette on our fun night. Come along to watch before booking a course there is a viewing gallery where you can sit. Excellent indoor facilities with a clean surface. It improves the owners handling skills as well as helping you to bond with your dog. 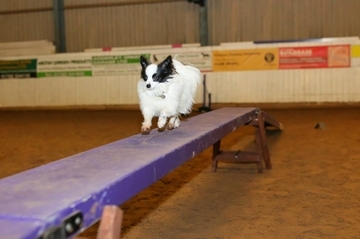 Agility can help build confidence in a nervous or timid dog. 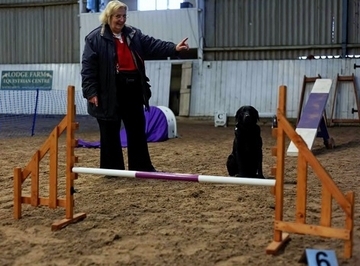 You need to have some basic control of your dog before doing agility. Your dog needs a good recall and a wait command, control off the lead, we can do some work on this in class if you need it, and as with all the classes needs to be good around other dogs. 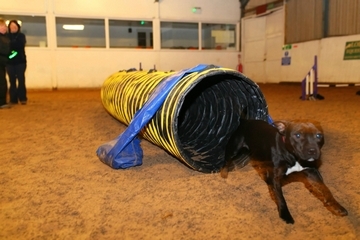 Your dog needs to be at least 12 mouths old before doing agility. Larger breeds may need to be older 11/2 to 2 years old to prevent injuries to joints that are not fully grown. Please come and watch a class before you book. I.A.B.T.C Basic Agility For Instructors Certificate. Please ring or email me to book a place. Click this link to pay for your course but please speak to me first.